From the sound of it, Smash Bros. creator Masahiro Sakurai has had enough. However, that doesn't mean there won't be more Smash Bros. games in the future. There just might not be Masahiro Sakurai Smash Bros. games. According to CVG, Sakurai discussed his future Smash Bros. involvement in an interview with Game Informer. 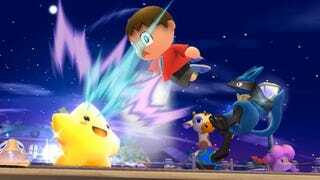 "I can't positively declare there won't be [another Smash Bros. game]," Sakurai said. ""With both Melee and Brawl, I made those games with the thought that there wouldn't be any more sequels. Thus, I really can't deny the chance for another. "However, as for myself, I don't think there will be." The reason, it seems, is that just how massive Smash Bros. development has gotten with the current 3DS and Wii U versions. So future titles would take the same amount of effort or more to satisfy players—something that Sakurai likens to "a noose around [my] neck." And even with all that effort, Sakurai thinks there would be unhappy gamers. "Our intention [with Super Smash Bros. for Wii U] was to provide extra merits to the game which go far beyond the sale price," Sakurai told Game Informer. "In terms of scope, and in terms of sheer number of characters, we went beyond our limits long ago. "And yet, if we cut the number of fighters or modes in a future game, I'm sure there would be complaints." Making Smash Bros. sounds incredibly taxing and even ended up physically affecting Sakurai. But even though, he does have difficulty in visioning his replacement. "That may seem like it contradicts my personal desire to keep giving gamers as much as I can, but I don't see any easy answer for it. And yet, despite that, I also have trouble picturing someone else taking my place and providing all this value-added content without me." How about Sakurai taking a very long vacation from Smash Bros. and coming back to this at a later date? Right now, on the heels of two back-to-back games, the guy seems burnt out. In case you missed it, here are ２０'s reviews for Super Smash Bros. for Wii U and for Nintendo 3DS.